The problem of efflorescence, or the deposit of water soluble salts on the surfaces of masonry, stucco, or concrete, is an old one, and one that has been studied and reported on as early as 1877. These reports are all in common agreement that efflorescence originates from more than one source, and may be made up of more than one or two compounds. In addition, other salts such as chlorides and nitrates, and salts of vanadium, chromium, and molybdenum are mentioned without giving specific composition. These last, particularly vanadium, are said to produce green efflorescence on white or buff burned clay units, while other salts produce white or gray deposits. Efflorescence derived from complex vanadium compounds contained in the clay used in brick manufacture is not uncommon in the southwestern part of the United States. There are any sources for water soluble salts with some salts more soluble than others. The movement of groundwater into building foundations and by capillary action, or wicking, upwards into masonry, stucco or concrete, is very often the case of efflorescence. In the case where soil conditions exhibit water soluble sulfates, precautions should be taken to preclude the passage of this sulfate bearing water to the structure. Low absorption is the best assurance against efflorescence. Properly graded aggregates, low water cement ratio, good compaction and proper curing practices will produce concrete of maximum density and low water absorption. Sand and gravel, in their natural state, may or may not have been associated with salt bearing water or soil. If they have, and these salts are not removed by washing, this can be a possible source for efflorescence. Most rock, sand, and gravel plants, however, are conscientious in washing material so that any contribution made to efflorescence from this source is negligible. When mixing water used for mortar, stucco, or concrete is obtained from a natural source, which has been in contact with a sulfate bearing soil, the resulting structure may exhibit efflorescence. The adherence, again, to a good concreting practice of low water cement ratio, will help reduce the appearance of salts from this source. Another potential source of soluble salts are clay products, such as building brick and face brick. Generally, in the present day manufacture of these products, the highly soluble salts are washed from the clay, and a barium salt such as barium carbonate is added to the product, to react with the calcium sulfate which may be present. In this reaction, the product is two fairly insoluble compounds – barium sulfate and calcium carbonate. When produced in this manner, clay products exhibit little tendency to efflorescence. It has also been noted that the occurrence of efflorescence bears a relationship to the type of mortar used. With a particular type of brick and a certain mortar no efflorescence may occur, whereas, the same brick with different mortar may produce a wall heavily coated with salt deposits. The appearance of sodium and potassium salts (as sulfates) usually suggest Portland cement mortar as the origin. The use of low alkali cement is mortar and grout will minimize efflorescence, at least from this source. Since, for the most part, concrete masonry is somewhat porous, evaporation of the salt bearing water usually takes place before reaching the surface when exposed to a drying atmosphere. The hydroxides are converted by reaction with the carbon dioxide of the air to alkali and calcium carbonates. 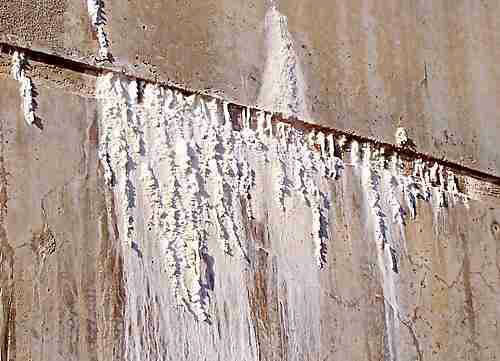 Efflorescence in the form of alkali chlorides and sulfates is formed when the structure is surrounded, exposed, or in contact with salt bearing water or soil and appears a columnar or whisker like crystals. Some of the sources of water soluble salts have been covered. These may be deposited on stucco, masonry, or concrete walls as efflorescence. Practically any building materials in direct contact with the earth are potential sources for water soluble salts. This fact has been recognized by the various producers of building materials, and steps have been taken to reduce their presence to a great degree. Several methods are suggested. One is to use high pressure water only or apply muriatic acid with subsequent flushing with water. Acid applied to brick masonry, without previous wetting, may cause “burning” or discoloration of the brick and may also eat into the mortar. The Handbook on Reinforced Grouted Brick Masonry Construction suggests the use of light sandblasting for removal of stubborn efflorescence. Allowing the surface to dry thoroughly and then using a stiff brush, prior to washing with water, has helped prevent re-penetration of the surface by the salt. Various methods have been used in attempts to remove efflorescence from masonry structures. It has been found that when soluble alkali salts cause efflorescence, the salts will dissolve in water applied to the structure and migrate back into it. These salts would then reappear on the surface as the structure re-dried. It was learned accordingly, that the best way to remove these soluble salts was to brush the surface thoroughly with a stiff brush. High pressure water blasting has been satisfactory for removing efflorescence from the face of concrete structures, since concrete is fairly well saturated with water. In fact, efflorescence in the form of alkali salts will be washed from the surface of concrete structures, if exposed to rain, over some period of time. If the coating is largely calcium carbonate or calcium sulfate, it adheres rather strongly and is difficult to remove by brushing. The practice developed in ths case for masonry surfaces, has been to saturate the structure as thoroughly as possible with water, and then wash with diluted muriatic acid, followed immediately with an alkaline wash, then washed with water. The acid recommended is five (5) parts hydrochloric to one hundred (100) parts water, or twenty (20) parts vinegar to one hundred (100) parts water. The alkaline wash recommended is diluted household ammonia. 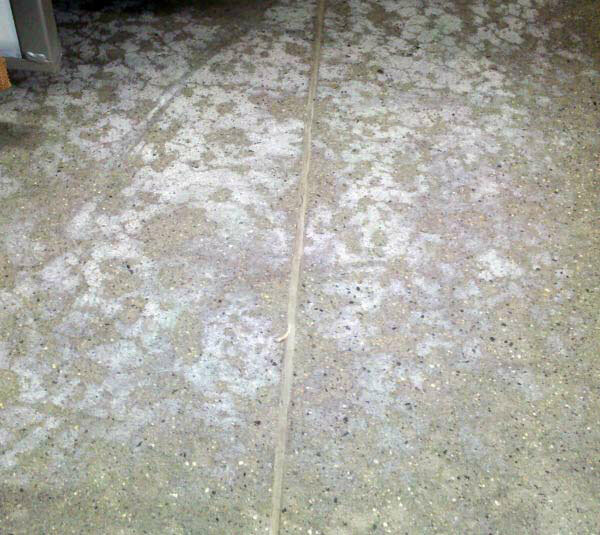 It takes much effort and time to clean off the residual salts of efflorescence therefore, the best course of action is to prevent it from ever happening again, or the first time. Simply sealing concrete from water penetration will prevent efflorescence. TRS creates an incredible water barrier for brick, mortar, and all forms of concrete. To help prevent efflorescence, TRS should be sprayed anywhere brick, mortar, or cement will be exposed to water. For example, applying TRS before any exterior below grade coating or electro metric membrane, will aid and greatly retard any chance of efflorescence in the future.